Oh, the sweet decadence of Vanilla Bean Crème Brûlée! 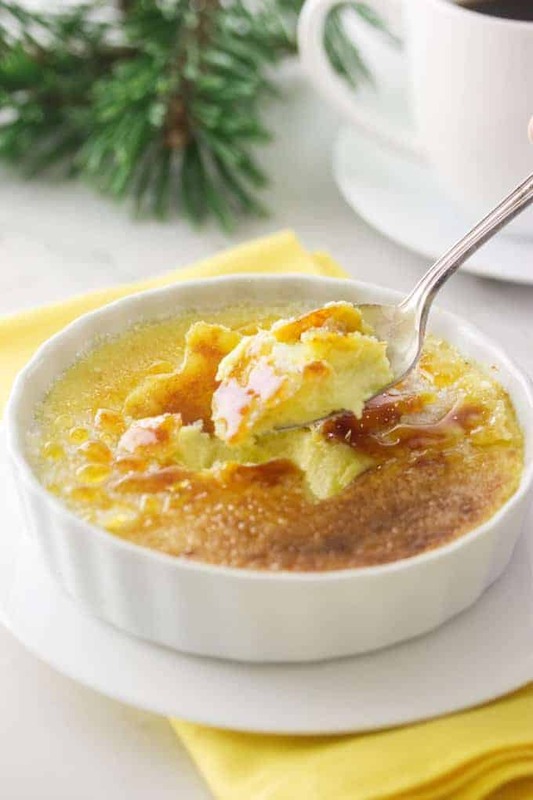 Crème Brûlée is a much-loved custard that has inspired a vast number of flavor variations. But it is hard to beat the taste of pure vanilla direct from the bean. 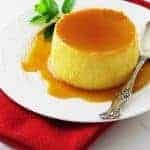 This elegant classic dessert is famous for its creamy custard and thin, crunchy, caramel topping. It is rich and silky smooth. 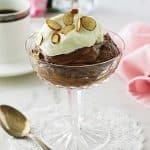 You can make this dessert in advance of a dinner party as it will keep several days in the refrigerator. It is a great dessert to finish off a special dinner. If you do much baking I am sure that you have noticed how the cost of vanilla has skyrocketed. In November of 2015, I purchased a nice supply of vanilla beans at Costco for what I thought was a reasonable price. Packaged inside of each little glass cylinder was three or four lovely vanilla beans. Soon after that, the vanilla bean crisis began! I have been hoarding these beans and this is the last of my stash. Where Do We Get Vanilla? Vanilla comes from orchids. Yes, orchids! There are three major species of vanilla orchids grown globally. The Vanilla planifolia is the most widely used orchid species to produce vanilla. This orchid grows as a vine and climbs up trees. The vine winds its way up the tree and can grow as tall as 30 feet. The Vanilla planifolia orchids is the major species and it is grown around the world. Madagascar supplies up to 75% of the world’s vanilla followed by Indonesia. How is the Vanilla Bean Produced? First, there is the flower but pollination must occur within a 12-24 hour time frame before a pod can grow. The pod is what we know as the vanilla bean. A pod will grow 6-10 inches in just six weeks. One vine can produce up to 100 pods a year! Each pod contains thousands of tiny black seeds with that wonderful vanilla flavor and fragrance. The black seeds are enveloped in an oily, pulpy substance, which is what we scrape from the pod when we use them in our recipes. Within the last few years, there has been a decrease in supply and an increase in demand. The United States is a top consumer of vanilla, not just for food production but also for scenting perfumes. Vanilla beans take three years before producing flowers. It is a huge labor-intensive production. The flowers have to be artificially hand-pollinated. When the beans are ready for harvest they are also hand-picked. Since the price increase, there is a lot of thievery going on so the farmers are now ‘branding’ their crops to protect their harvest. This branding or tattooing is also done by hand. Weather conditions, like cyclones, also devastate and destroy the crops contributing to the high cost. Vanilla beans are currently selling for about $10 per bean. Now that I have totally discouraged you about buying pure vanilla and vanilla beans, I have to tell you there is another way to get your vanilla fix without having to buy a supply of vanilla beans. It is vanilla paste. This is a great alternative to the actual bean. You get the full pure flavor of vanilla plus the little black seeds as well. It is the natural pure flavor of the bean without the slicing and scraping and it is a less pricey alternative. 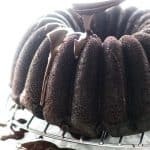 According to information from one of the leading suppliers of vanilla products, Nielsen-Massey Vanillas, Inc., vanilla bean paste can be used in lieu of the bean. Still, vanilla bean paste is not inexpensive but it is more affordable. A four-ounce bottle will cost you about $25. There are twenty-four teaspoons in a four-ounce bottle so that is $1 per teaspoon. Some folks are a little intimidated in making French recipes and I admit that some of the recipes in my Julia Child French cookbook do look a little intimidating. 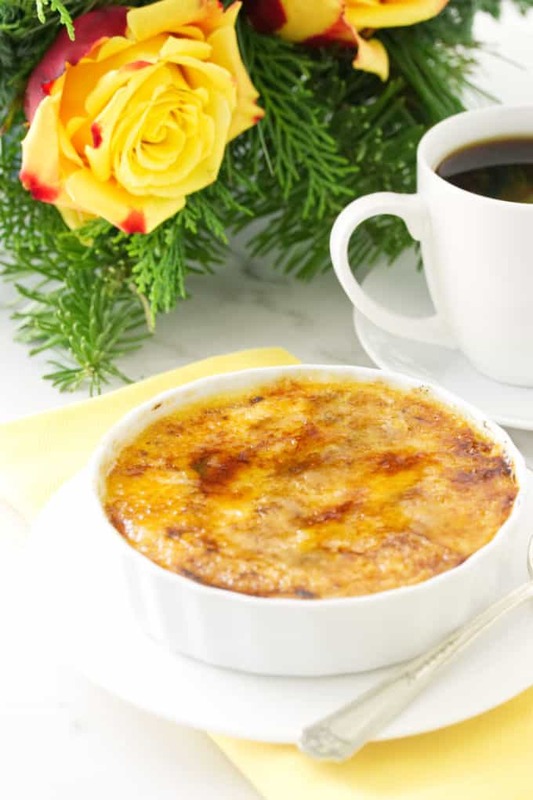 This recipe for vanilla bean crème brûlée has been adapted from my Everything Easy French cookbook. 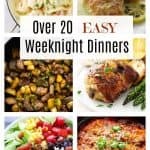 It is really and truly easy! 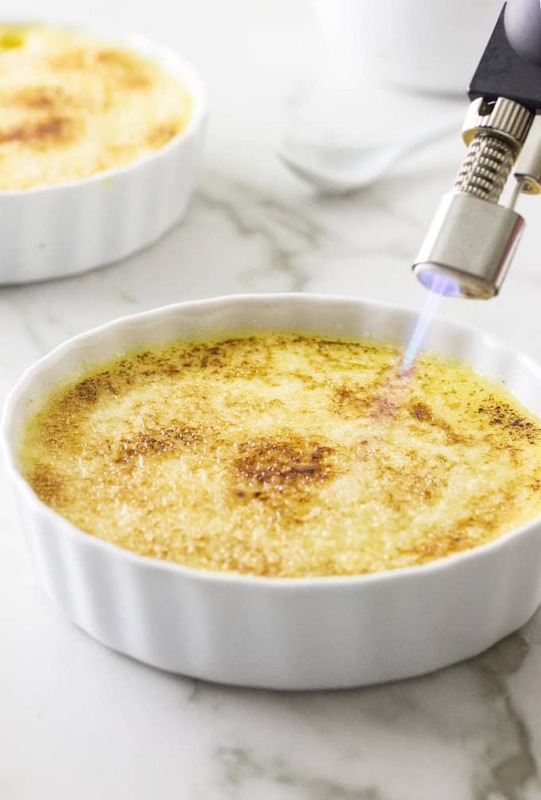 Crème Brûlée is one of the easiest desserts you can make. Just eggs, milk, cream, sugar, and vanilla! 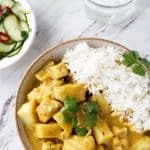 With this recipe, you don’t even have to mess with a water bath! It is just a matter of heating the milk to steep and extracts the flavor from the vanilla bean. Then, stir the sugar into the warm milk and allow the milk to come to room temperature and stir it into an egg-cream mixture. Stir the cream and eggs with a spoon. The electric mixer or a whisk will create too many bubbles or foam which will leave small craters on the finished custards. I like to pour the mixture through a fine-mesh strainer to remove any bits of egg and any foam. Divide the mixture into six small shallow ramekins. Set the ramekin on a baking sheet and bake at 225°F. Key to making a smooth, silky crème brûlée without a water bath is low heat and remove from the oven while still wobbly in the center. 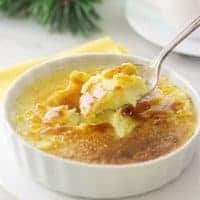 This elegant Vanilla Bean Crème Brûlée classic dessert is famous for its rich, creamy custard and thin, crunchy, caramel topping. 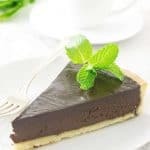 It is rich, and silky smooth and can be made in advance. Add the whole milk to a saucepan set over medium heat. 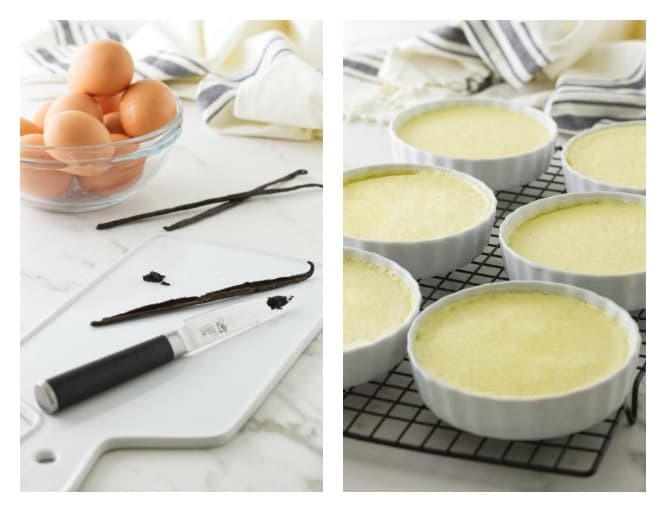 Using a paring knife, split the outer layer of the vanilla bean from the top to end. Spread the bean flat and scrape the seeds from both sides. Add the seeds to a small dish with 1 tablespoon of warm tap water and stir to loosen them then whisk them into the milk. Heat the milk almost to a boil, then remove from the heat and let the vanilla bean steep. Add the sugar and stir to dissolve, cool to lukewarm. In a large bowl, whisk the egg yolks until pale. While continuing to whisk gently, slowly pour the cream into the egg mixture. Remove the vanilla bean from the cooled milk-sugar mixture and pour into the egg-cream mixture. Add the salt and combine well. Strain the mixture through a fine-mesh strainer to remove any egg bits and foam. Transfer the mixture to a spouted pitcher and fill each ramekin. Transfer the baking sheet with the ramekins to the middle rack of the oven and bake for 55-60 minutes. Remove from the oven and place on a wire cooling rack until they come to room temperature. Transfer to the refrigerator for at least 4 hours or overnight. Within 15-20 minutes of serving, set the oven to broil and place a rack to it’s highest level. 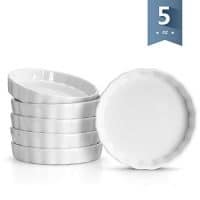 Take the ramekins from the refrigerator and sprinkle a tablespoon of sugar on each one. Set the ramekins on a baking sheet and place under the broiler for 2 minutes. Remove as soon as the sugar turns liquid and begins to caramelize. Alternatively, use a kitchen brulee torch to melt the sugar and get a nice crust. 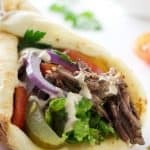 Refrigerate for 10-15 minutes to cool and serve within 1 hour. If you are using vanilla bean paste, or vanilla extract then skip the heating of the milk mix the milk with the cream and eggs. Stir the cream and eggs with a spoon. The electric mixer or a whisk will create too many bubbles or foam. I like to pour the mixture through a fine-mesh strainer to remove any bits of egg and foam. The depth of the ramekins will determine how long they will take to bake. A shallow dish will bake in less time than a deeper dish. The center of the custards should be a bit wobbly, they will continue to cook from residual heat as they cool. To get the ramekins a little closer to the broiler unit, set the dishes on an inverted baking sheet. Broil until the sugar is golden and syrupy. About 2 minutes. 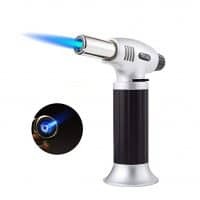 A small kitchen brûlée torch is handy for one or two custards but will take longer to torch all six individual custards. If you are unfamiliar with your torch, try practicing first. Prepare an instant vanilla pudding in dishes, sprinkle with sugar and torch it.